MINISTER FOR EDUCATION Ruairí Quinn has underlined his opposition to the return of tuition fees for third-level education – but has indicated that the economic situation may mean students will have to shoulder new fees. Speaking in the Dáil this afternoon, Quinn said every public service came at a price but that the key priority for the coalition was access to that service across all sectors of society. “It is not desirable in my view that a new barrier should exist to prevent those socio-economic groups – that we’re trying to get into the third level sector – from participating,” the minister stated. Quinn said he had asked the Higher Education Authority to formulate proposals that would minimise the barriers for people entering college, but was at pains to underline that he had “not changed my values on access to third-level education”. The minister warned, however, that the country’s precarious financial situation might mean Ireland had no choice but to introduce some kind of new charge on its students. “I think you have to recognise that we don’t live in the country we would like to live in,” Quinn said, responding to questions tabled by Richard Boyd Barrett of the United Left Alliance. Ireland had “lost our cheque book,” he added, bemoaning the reality of the Central Bank having to furnish weekly updates on the national finances to the European Central Bank in order to guarantee the provision of emergency bailout funds. That financial situation meant that tough decisions would have to be made in regard to where the government was forced to cut its current spending. “We’re not going to discover new crocks of gold,” Quinn lamented. 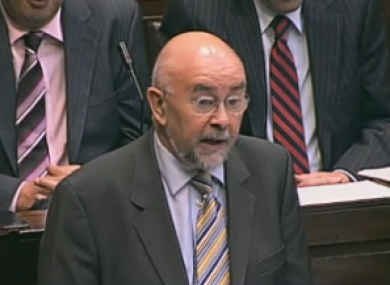 Quinn’s assertion comes on the back of increased speculation that the new government may reintroduce tuition fees for third-level education – despite the minister having signed a public pledge in February, when he told the Union of Students in Ireland he would not levy new charges on students themselves. Boyd-Barrett argued that it was ironic that the EU was considering allowing Greece to reschedule its bailout repayments on foot of revolts led, in part, by third-level students in Greece. Separately, the Minister of State for Training and Skills, Ciarán Cannon, defended the government’s decision not to rescind the €200 entry fee for Post-Leaving Certificate (PLC) courses which is planned for introduction this year. “While PLC learners are generally from the lower socioeconomic categories, students from less well-off families are being protected,” Cannon said. The junior minister wondered whether students who could not meet the €200 registration fee would be able to cope with the other financial burdens of full-time further education. Email “Quinn insists: I don't want to bring back third-level fees”. Feedback on “Quinn insists: I don't want to bring back third-level fees”.